Buying a house is a lot like shopping for a used car—you don’t always get everything that’s on your wish list. The key is to keep an open mind and tap into your imagination. But since that’s difficult for a lot of people, we’ve identified six things that might look like total deal breakers at first glance but really aren’t. The average kitchen remodel costs a whopping $62,158, according to Remodeling magazine. But the good news is a lot kitchens don’t require a full-scale renovation. “As long as the cabinets aren’t 20 or 30 years old, repainting and adding new handles is relatively cheap and can change the entire look of the room,” says Sanderfoot. If you want to go a step further and refinish the existing cabinets—a process that involves removing, sanding, and staining the doors or drawer fronts—you will spend only about $1,400 to $3,500, according to home services marketplace HomeAdvisor. Unfortunately, this happens a lot: You walk into a house and get hit with the smell of a wet dog or cigarette smoke. Or worse. Fortunately, there are a number of low-cost ways to banish bad smells for good. If there’s a lingering odor in the kitchen from strong-smelling foods, your best move is to hire a professional kitchen cleaning service. (Rates usually range from $50 to $150 an hour.) But a cheaper option is to coat the cabinetry with odor-blocking primer sealant such as Kilz ($17, Home Depot). However, one smell that might be more difficult to remove is cigarette smoke, says Chris Dossman, a real estate agent with Century 21 Scheetz in Indianapolis. You can try combating it by washing the walls and windows and dry-cleaning curtains and upholstery. If that doesn’t work, you might need to hire a smoke-damage restoration company. If seeing rooms covered with 1960s-era prints makes you want to sprint out of the house, try to picture the place with new wallpaper you love. In fact, removing and hanging wallpaper is surprisingly easy to do yourself. But if you want to hire a contractor to do it, professional wallpaper installation is going to set you back only about $500 per room, according to HomeAdvisor. The caveat? If you’re renovating an older home, electrical wiring, wall outlets, panels, or amperage might need to be upgraded to support a more modern lighting system, HomeAdvisor says. 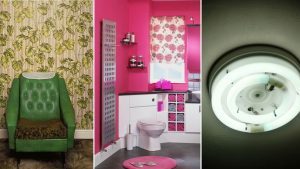 A bubble-gum-pink bathroom or mustard yellow den might make you cringe. So change the color scheme! You can paint a room with your own two hands—and make it look professional—without draining your wallet. (Note: Most homeowners who hire professional painters will pay between $380 and $790 for a 120-square-foot room.) The trick is to pick a color that’s going to make a room look bigger, like gray or cool blue. Also, make sure to safely dispose of leftover paint. We all know carpet gets damaged over time. Still, many home buyers have trouble seeing past carpet that either has to be replaced or just needs a little TLC. “Buyers always focus on old or dirty carpeting,” says Sanderfoot. Fortunately, cleaning carpet is easy and cheap. If you decide to install new carpet, expect to spend $2 to $5 per square foot for middle-grade carpet material, HomeAdvisor says. So, for 1,200 square feet of new carpet you’re looking at roughly $2,400 to $6,000. To save money, Sanderfoot recommends home buyers remove the carpet themselves. “It’s easy to tear up and can save you a few hundred bucks,” she says. When you go house hunting, try to look past aesthetic issues and focus on what’s most important: location, size, price, and any other non-negotiables. Criteria you should be less willing to budge on are number of bedrooms, a large yard for a pet, or a specific school district. Also, don’t forget you can make repair requests when you make an offer. “You may be able to persuade the seller to make cosmetic changes for you,” says Sanderfoot.